Phoenix Contact has extended its range of splice boxes with the new FO range. These FDX 20 series splice boxes ensure continuously reliable data transmission in real time. 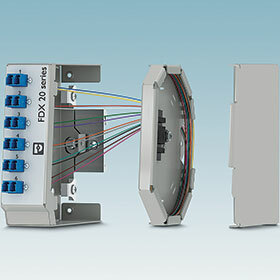 With their compact and uniform design, the splice boxes provide ample interior space for the secure connection of fibre optics. They are available in connection versions with 6x ST duplex, 6x SC duplex, 6x E-2000- (LSH), or 12x LC duplex connections. The patented pigtail tray in the device interior enables the convenient splicing of the FO conductors, as well as minimum and yet safe bend radii. The ready-to-splice pre-assembly significantly reduces mounting times and improves the clarity of the splice boxes in the control cabinet, thanks to the intuitive front operation and consistent product design. Pitram from Micromine can assist mining operations to automate and boost efficiency.